Fair Winds Press, 9781592336432, 176pp. "How do you get your protein?" As a vegan, you're sure to get asked this question often. Most likely, you've even thought about it yourself. Vegan protein comes from things like tofu and tempeh, to beans, nuts, and protein-rich whole grains like quinoa. There are loads of options out there, but how to prepare them? What to put them in? These are questions that can feel daunting, especially if you haven't used these ingredients before. Never fear, Celine Steen and Tamasin Noyes to the rescue! 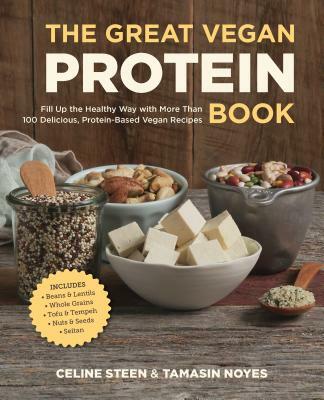 The Great Vegan Protein Book takes you step-by-step through each protein-rich vegan food group, providing you with valuable information on how to prepare the ingredient along with more than one hundred delicious and easy recipes (many of them low-fat, soy free, and gluten-free!). Each recipe uses whole food ingredients that can be easily found at most grocery stores or farmer's markets-no hard-to-find ingredients or things you can't pronounce. Say yes to protein and eating better with The Great Vegan Protein Book! Celine Steen is the co-author of 500 Vegan Recipes, The Complete Guide to Vegan Food Substitutions, Hearty Vegan Meals, Vegan Sandwiches Save the Day!, Whole Grain Vegan Baking, The Great Vegan Protein Book, and the upcoming The Great Vegan Grains Book. She is the founder of the award-winning blog Have Cake, Will Travel (www.havecakewilltravel.com). Tamasin Noyes is the author of American Vegan Kitchen, Grills Gone Vegan, Vegan Sandwiches Save the Day!, Whole Grain Vegan Baking, and the upcoming The Great Vegan Protein Book. She is the founder of www.veganappetite.com and has worked as a committed cookbook tester for many well-known vegan cookbook authors (such as Isa Chandra Moskowitz, Terry Hope Romero, Robin Robertson, Dynise Balcavage, and Kelly Peloza) and has cooked in several restaurants.